Butterfly Milkweed (Asclepias Tuberosa) is a native plant that creates a wonder area of your garden for monarch butterflies. The Growers Exchange wants to encourage our gardening friends to set aside a sunny space in their gardens to help these majestic butterflies thrive and slow the decline of their population. The bad news: there can be no question that natural habitats, areas where monarch butterflies live, are being destroyed at an alarming rate. Habitat destruction, defined as changing an area in which a plant, animal or other organism lives to the point where that species can no longer survive. The destruction is generally described as either actual destruction, degradation or fragmentation. In the case of the Monarch butterfly, the major threat to their survival is the loss of milkweed habitat, which is an essential plant in their life cycle. According to the U.S. Fish and Wildlife Service, the counts of Monarch butterflies are trending down sharply, and their migration is now under threat. The good news: restoration of habitat can be achieved with very little effort on the part of concerned gardeners. 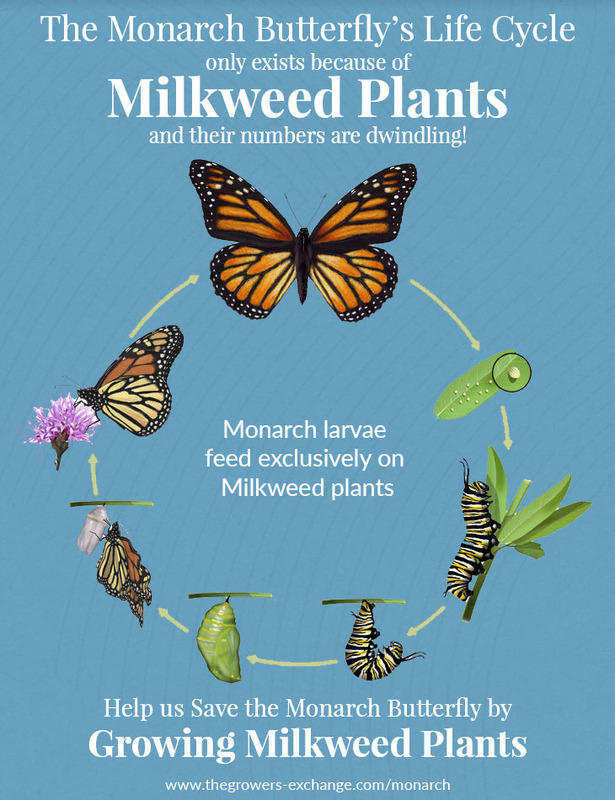 You can easily offset this loss of a critical host plant in your own yard by planting milkweed, the vital host plant for Monarch butterflies. What is a Monarch Butterfly Host Plant? 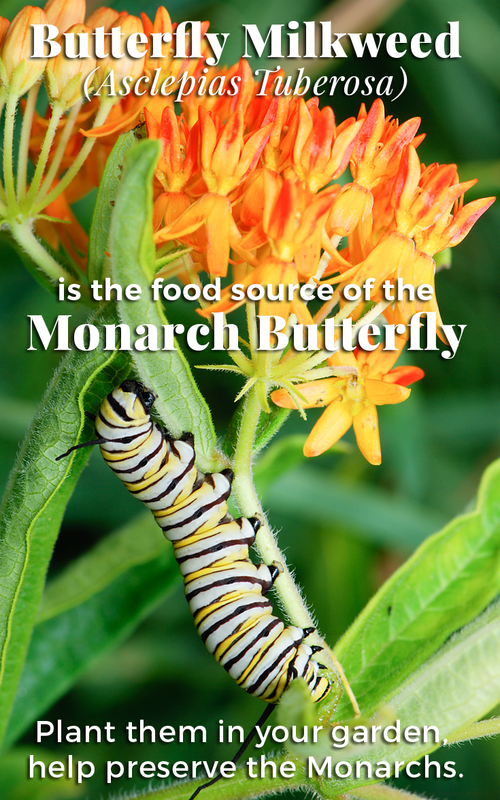 Monarch larvae feed exclusively on Milkweed plants, and we grow a native Milkweed species: Butterfly Milkweed (Asclepias Tuberosa) that has been recommended by Monarch Watch, Wild Ones and the North American Butterfly Association. Arrival: In February and March, the Monarch butterflies that have been hibernating in Mexico and California begin to ‘wake up’ in order to find a mate, and begin their northward journey. Once they arrive, the female will lay her eggs on the Milkweed host plant. The chrysalis stage is where the transformation takes place, and although from the outside, the caterpillar is going through an amazing conversion known as Metamorphosis and in 10 days, it will emerge as a beautiful butterfly. When it emerges, it will need nectar from flowering plants to thrive. The 4th generation of butterflies, born in the fall, will have a much longer lifespan and will undertake a long and perilous journey. This group will migrate south, to Mexico and California, and will spend 6 + months hibernating, in order to return the following February. The nectar provided for this generation is the ‘fuel’ for its journey. Chose a sunny spot in your garden, and remember to pick an area that is protected from wind. Plant plenty of larval host plants. Monarchs need milkweed. Please remember that you are planting food for caterpillars so chewed up leaves are a good thing! In addition to your host plants, remember to plant an array of plants that flower at different times to attract and feed butterflies throughout the season. Avoid any herbicides and pesticides. We are encouraging all of our customers and friends to join this initiative. This is an easy way to create meaningful change for the Monarch population, and to aid in stemming the tide of decline. 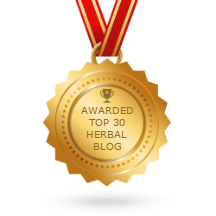 Please remember to share your success stories with us, and send photos! Original images from Wikimedia & Pixabay. Caution is highly recommended when handling this plant. The milky sap can cause contact dermatitis in some people.& if transferred to the eyes can cause blindness for 24 hrs. It is toxic to chickens. If more than 10% of body weight is ingested (fresh or dry) by horses, cattle, goats, or sheep, it can cause death. Thanks Ms. Sterling Cone for that comment, I will be very, very careful wearing gloves when planting and weeding around these babies. Thank you, thank you, THANK YOU!!!!!! When I was a little girl, we saw Monarch butterflies everywhere! Now you hardly EVER see them…. We had a “milkweed” plant/bush in our front yard and I knew the Monarchs liked it but I didn’t realize it helped them survive. I am ALL IN to save these absolutely beautiful butterflies from extinction. Please let me know everything I can do. Thank you! We are doing everything we can to educate and have a great ‘giveaway’ for free plants (Asclepias) this month! My milkweed is COVERED with yellow aphids. How do I get rid of them without killing any eggs on the plants? Help! Monarch eggs are more tightly attached to leaves than aphids, so with just the right amount of pressure you may be able to wash off aphids without destroying the eggs. Sprayed water may only dislodge the pests, which can climb back up on their own or be returned by aphid-harvesting ants. Soapy water may dislodge and kill more aphids, but it also is more damaging to the monarchs and can build up on the plant. Though tedious, dabbing aphids with cotton swabs dipped in isopropyl (rubbing) alcohol is most effective. That kills them outright. Alcohol, however, also is lethal to monarch eggs and larvae, so care must be taken when dabbing. Natural controls for the pests, sometimes called oleander aphids, include the ladybug, especially in the larval stage, as well as the lacewing, syrphid fly larvae and the tiny wasp Lysiphlebus testaceipes. Some of these are available in stores and online. Sounds like Katie has got the answers! I planted chives next to a sedum plant with aphids the next morning they were gone. Guess they didn’t like the smell. That’s something I’ve never heard before … ! Does milkweed come up ever year after it is planted or do you have to replant every year? I planted some last summer and now I can’t find them. I don’t think they are going to come up or either they have died. This milkweed variety is not native in most of the US. I applaud the effort in trying to restore habitat for Monarchs, but it’s very important for people to grow varieties that are native to their area. 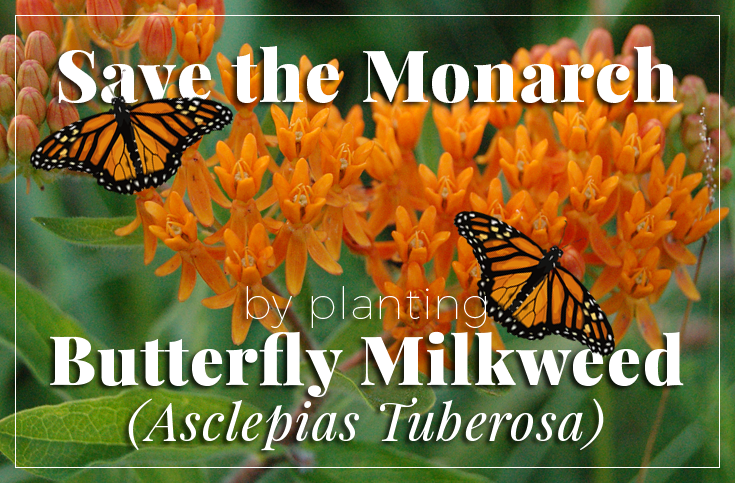 There is research that indicates that growing Asclepias Tuberosa may actually be causing harm to the Monarch population. Please do not plant non-native species. 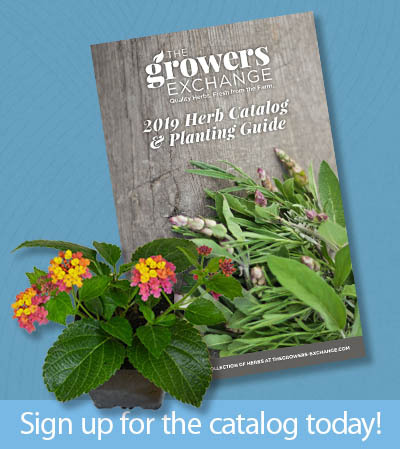 Learn what is native to your specific area and only grow those varieties. Thanks so much for your input, and we appreciate it. Our understanding, from research, is that we should be informing gardeners of not planting tuberosa near ‘natural’ areas, but should be ok for the home gardeners. There is a lot of conflicting information, but we are trying to gather as much information as possible from reliable sources! I’m in zone 9, south Louisiana, & grow ‘Silky Deep Red” asclepius curassavica. It’s a Monarch magnet here. I started it 7 years ago from a plant I bought at a local Master Gardener sale. It does send seeds every where but I’ve learned to cut them right when I see the pod forming after a flower cluster & enjoy the ones that do come up randomly in my back yard. It’s July & I’ve seen the 1st cycle of Monarch’s propagate for this summer. They are a sight to watch from my patio where there are several around at the same time. Great tip re: the pods! Just a heads up! Milkweed will sometimes re-seed prolifically. 10 years ago, I started with 1 plant that a friend gave me. I now have 50+ plants in my garden! I also have tons of monarchs hanging around on a daily basis! Take a look at ‘tabby cat’ – good suggestion!